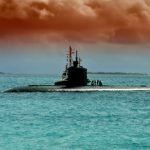 The U.S. Navy plans to procure 12 Columbia-class nuclear submarines to replace its fleet of Ohio-class ballistic missile vessels as part of the Defense Department’s plan to modernize the U.S. nuclear triad amid security threats posed by North Korea, Russia and China, National Defense Magazine reported Friday. The service plans to buy the first Columbia-class submarine in fiscal 2021 and expects the vessel to enter service by 2031. Vice Adm. Terry Benedict, director of Navy strategic systems programs, said General Dynamics’ Electric Boat subsidiary has begun to develop a new infrastructure to deliver the new Columbia-class submarines to the military branch. Another nuclear modernization effort at the U.S. Air Force is the Ground-Based Strategic Deterrent program designed to replace the Minuteman III intercontinentinal ballistic missile system. The service awarded separate contracts to Boeing and Northrop Grumman in August to conduct technology maturation and risk reduction work for GBSD program. The GBSD program’s preliminary design assessment is expected to conclude in 2020. Todd Harrison, director of defense budget analysis at the Center for Strategic and International Studies, said the Air Force is set to ramp up several modernization efforts by early to mid-2020s and those include the B-21 bomber aircraft, F-35 fighter jets and KC-46 tanker planes. The Air Force also plans to buy approximately 1,100 Long Range Stand-Off nuclear cruise missiles for integration with the service’s fleet of bombers under a potential $10 billion program, according to the report. Lockheed Martin and Raytheon received Air Force contracts in August to provide technology maturation and risk reduction support for the LRSO program, the report added.